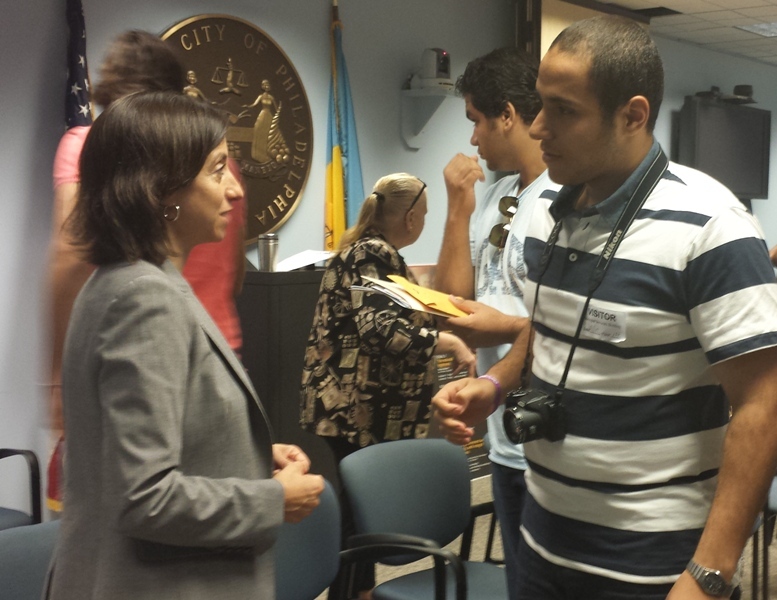 On Monday, PCHR laid out how diversity and inclusion plays a significant, and legally protected, role in Philadelphia government for some two dozen visiting college students from the Middle East touring the United States. PCHR represented one of three city agencies participating in the Dialogue Institute’s 2014 Study of the U.S. Institute for Student Leaders on Religious Pluralism and Democracy in the United States. The attending students hailed from Iraq, Egypt, Lebanon, and Turkey, among other nations. Philadelphia was among one of several stops in their program, which included checking in with policy makers in New York and Washington D.C.
PCHR Executive Director Rue Landau, Deputy Directors Reynelle Brown Staley and Randy Duque shared the mission and role of PCHR, while Patricia Coyne, veteran community relations representative, offered a review of past PCHR cases. PCHR Executive Director Rue Landau chats with one of the two dozen visiting scholars participating in the Dialogue Institute’s municipal education program. The visit was coordinated by the Mayor’s Office of Immigrant and Multicultural Affairs and also featured a presentation from the city’s Commerce Department. 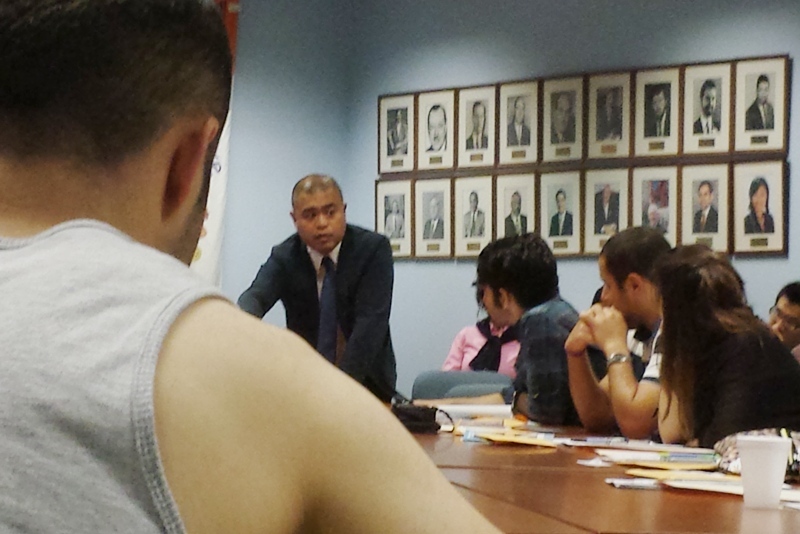 Deputy Director Randy Duque leans in to share insights about PCHR’s role in the city — and the lives of immigrants living here. Each agency offered insight into how they assist new Philadelphians get settled and integrated into the city, from the basics to the legal side of things – and personal reflections on life as an immigrant as well. In fact, a similar flag-raising for Liberia is in the works, a gesture of symbolic healing, considering the sizable population of Liberians here and recent tragedies that have beset it. The fact that 12 percent of the city’s population is foreign-born and the outsized impact immigrants here have on founding flourishing enterprises piqued attention. Questions from students sought to glean opinions on the current immigration reform debate raging across the nation, as well as the steps needed to become U.S. citizens. Their majors ranged from medicine to business management. This entry was posted in In Action, News and tagged American University, Dialogue Institute, Fernando Trevino, Immigration, Liberia, Liberians in Philadelphia, Mayor's Office on Immigrant and Multicultural Affairs, MOIMA, Patricia Coyne, PCHR, Philadelphia, Philadelphia Commission on Human Relations, Randy Duque, Religious pluralism, Reynelle Brown Staley, Rue Landau, Student exchange programs, Temple University, U.S. Student Leaders on Religious Pluralism and Democracy in the United States. Bookmark the permalink.